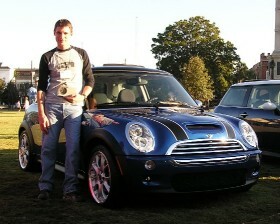 MINI Life in Charleston: I Did It! Well guys and gals, I did it! I finnished the 30th Annual Cooper River Bridge run, all running, no walking. I came in 8,333 place, finnishing the 10k in 1:00:06. To think that with a little more effort and I would have had a time of less than an hour! Oh, well - next year perhaps. Check that goal off my list for the year! I'll be in Charleston Friday. I hope I can stop by the dealership. R56 Thoughts . . .
Just Another Pic of Morris . . .